Take an 1880 short novel by Henry James, filter it through a 1947 script by Ruth and Augustus Goetz (who also wrote the 1949 screenplay that starred Olivia de Haviland and Montgomery Clift), and fill the stage with a Victorian richness and intense performances, and you have the latest 2nd Space offering by the Good Company Players, The Heiress, which runs through June 17. Dr. Austin Sloper (Noel Adams) blames his daughter Catherine (Suzanne Grazyna) for the childbirth-death of the wife he has deified in his mind. He considers the young woman plain and stupid when she is merely stunted by a lack of parental love. 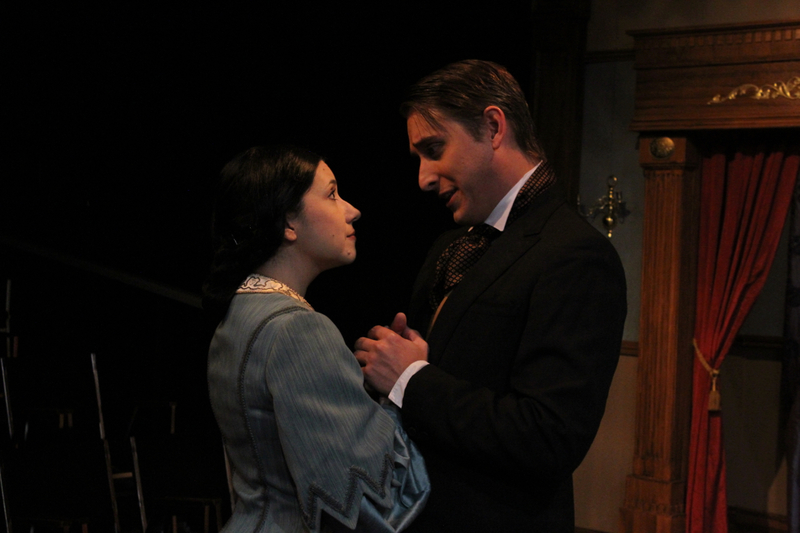 Along comes the dashing Morris Townsend (Chase Stubblefield) to sweep her off her feet with honeyed words and the help of a widowed aunt (Amelia Ryan) of Catherine’s. Dr. Sloper does not trust the young man’s motives because the girl would inherit $30,000 (a live-in-luxury sum in those days). He tries to keep them apart, but they make plans to elope. The doctor says he will disinherit Catherine if she marries the man he considers a fortune-hunter, leaving her with $10,000 from her mother. With most of the money disappearing, the question is: is Morris in love with her…or her money? Grazyna balances Catherine’s facets deftly—witty and wise among women, withdrawn and unsure among men. She matures with exposure to the world and romance, adding a cutting edge that defies trust. 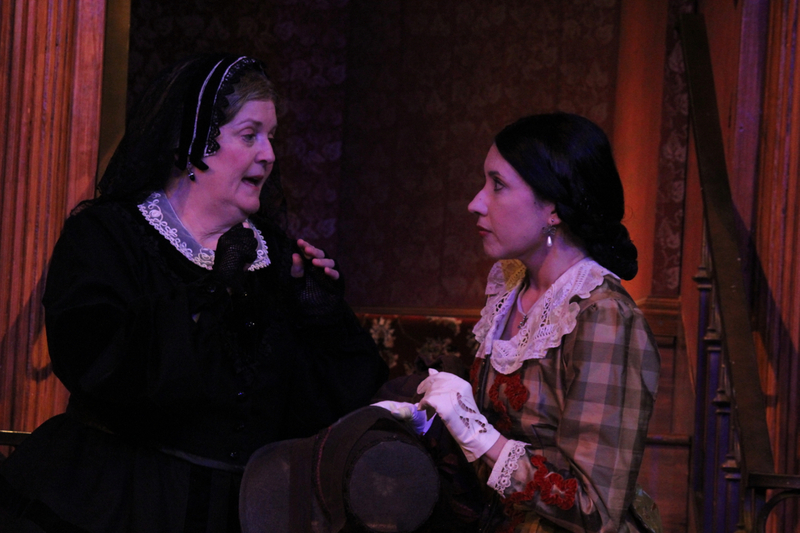 For an actress who has played both Hermia in A Midsummer Night’s Dream and Petruchio in The Taming of the Shrew for the Woodward Shakespeare Festival, the variety of attitudes is not an insurmountable stretch. She doesn’t really look plain, but perhaps that is just the doctor’s perception. 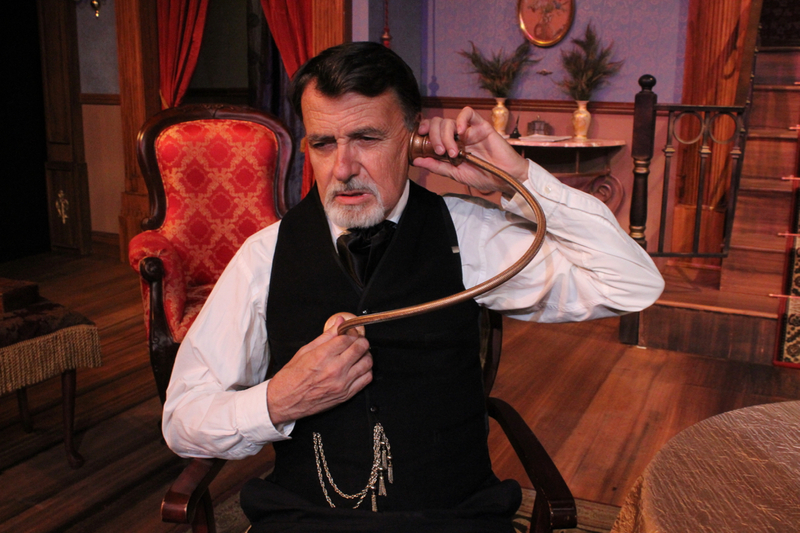 Adams portrays the father as a victim of Captain Von Trapp’s Syndrome: having lost the love of his life, he straitjackets his child in unrealistic rules, but there is no “problem like Maria” to warm his cold heart. He is disappointed by Catherine, distrustful of anyone who might see something desirable and of value in his daughter, and quick to speak unkind words. Adams makes the man strong-willed and wrong-headed, as much an object of scorn as the dad in a modern sitcom family, but with more pity. Stubblefield has played a number of glib young men for GCP, but Morris has more of an air of desperation. He pursues Catherine, giving her the affection and attention she has been denied by her father. Sometimes, it’s layered on thickly, but there is enough restraint to give him a reasonable doubt—Maybe he sees the pearl of great price others have passed by. It’s a mature interpretation, and sparks lively audience conversations during the intermission. Ryan plays a woman (who thinks she has a knowledge of the world) with a bubbly zest that belies the character’s background as a minister’s wife. Debbie Walker portrays Morris’s sister, who justifies and enables him while denying herself and her children to keep him afloat. The blended directorial talents of Elizabeth Fiester and Karan Johnson have brought us a showcase of solid acting, another lush set by David Pierce, and stunning costumes (reflecting several strata of 1800’s society) by Ginger Kay Lewis-Reed. The issues raised might seem quaint to us, but they are life-and-death serious to the characters in this play. 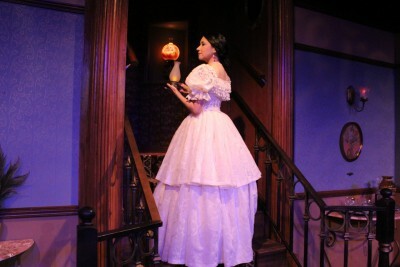 Grab your carriage (with or without horse) and travel swiftly to the 2nd Space Theatre at 928 E. Olive Ave. in Fresno. For tickets and further information, contact www.gcplayers.com, or call (559) 266-9494, or check out KRL’s Good Company Players event page.